ST. LOUIS–Aaron Rodgers completed 10 of 12 passes for 134 yards in a little more than a quarter of work, and the Packers held a 9-0 lead over the St. Louis Rams at halftime of Saturday’s preseason game at the Edward Jones Dome. A 33-yard pass from Rodgers to Jermichael Finley got the Packers rolling early in the second quarter. Eddie Lacy followed with a powerful run of 11 yards. On third-and-five from the Rams 21, Rodgers was sacked by Robert Quinn. Mason Crosby was then good from 48 yards, his second field goal of the game, which gave him an early lead in his competition with Giorgio Tavecchio. Cornerback Davon House atoned for having been beaten a couple of times in the Packers’ preseason opener last week by knocking away a pass while in tight coverage on a third-down play. That play helped give the Packers the ball at their 35 following a Rams punt. At that point, Rodgers was replaced at quarterback by Graham Harrell with 9:38 to play in the first half. Harrell avoided an interception on his first play when the Rams were flagged for pass interference. Tight end D.J. Williams didn’t help Harrell’s cause by dropping a perfectly thrown deep pass up the seam. A play later, tight end Brandon Bostick hauled in a 13-yard dart by Harrell. A drop by wide receiver Tyrone Walker, his first of two, didn’t help matters, and Harrell’s first series ended with a Tim Masthay punt. The Packers went to a mixture of ones and twos on defense midway through the second quarter, but there was no falloff in the defense’s play. Rookie cornerback Micah Hyde got credit for another pass defensed and continued his strong play. Rams kicker Greg Zuerlein missed wide to the right from 50 yards and the Packers defense continued to pitch a shutout. Green Bay scored its third field goal of the game when Tavecchio hit from 38 yards with two seconds left on the first-half clock. Lacy carried eight times for 40 yards and displayed his power running style on a 15-yard run in the first quarter. Finley led the Packers in receiving in the first half with four catches for 78 yards. Rodgers threw wide of Finley on a pass that offered touchdown potential on the Packers’ first drive of the game. ST. LOUIS–The Packers offense moved the ball but had to settle for a Mason Crosby field goal and a 3-0 lead over the St. Louis Rams after one quarter of play at the Edward Jones Dome on Saturday night. The Packers offense exploded out of their one-game funk with a game-opening drive that featured the power running of rookie Edddie Lacy and the precision passing of Aaron Rodgers. Lacy followed a 25-yard pass from Rodgers to tight end Jermichael Finley by running through several defenders for 15 yards and a first down at the Rams 22-yard line. On third-and-one at the 13, Lacy carried around left end for what was a gain of seven yards, but the play was nullified by a holding penalty against Finley. 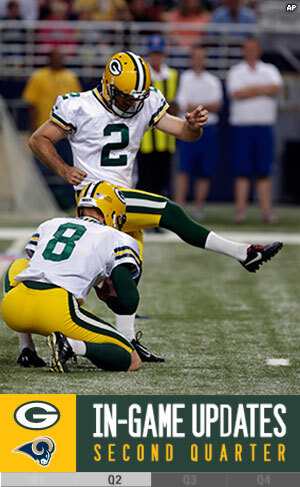 The Packers had to settle for a field goal attempt by Crosby, who split the uprights from 34 yards. Rookie cornerback Micah Hyde helped stall the Rams’ promising first drive of the game by nailing running back Isaiah Pead for a 6-yard loss. The Rams failed on a fourth-and-five play, turning the ball over to the Packers at their 36-yard line. Rodgers went right to work on his second series of the game by completing a 26-yard pass to wide receiver Jarrett Boykin, who broke two tackles on the play. On second-and-one, Rodgers missed a wide open Finley up the seam, and on third-and-one Lacy was tackled for a 2-yard loss, as the Rams defensive line penetrated into the backfield to disrupt the flow of the play. Kicker Giorgio Tacvecchio then missed on a 49-yard field goal attempt, wide to the left. The Rams took possession at their 39-yard line and on the first play from scrimmage quarterback Sam Bradford hit wide receiver Chris Givens in stride with a 57-yard bomb. Givens had beaten Hyde, who was in single coverage. Hyde recovered to make a nice stop on a second-and-goal pass completion at the 2-yard line, and the Packers defensive line forced a fourth-and-goal play by stopping Pead at the 1-yard line on third down. Bradford fumbled the snap from center on fourth down and the Packers retained their 3-0 lead. – Green Bay (0-1) visits St. Louis (0-1) tonight to take on the Rams in the Packers’ first road contest of the preseason. – Despite squaring off 93 times (including two playoff meetings) in an all-time series that dates back to 1937, this marks just the fourth preseason meeting between the clubs. The Rams hold a 2-1 edge in the all-time preseason series. – This will be the first time Green Bay has faced the Rams in the preseason since they moved to St. Louis in 1995. The three previous preseason meetings took place in 1984, 1992 and 1994, with the last matchup coming at Camp Randall Stadium in Madison, Wis., on Aug. 6, 1994, a 14-6 Green Bay victory. The games in 1984 and 1992 were played in Los Angeles. – Tonight will mark just the Packers’ second preseason game played indoors under Head Coach Mike McCarthy (2006-13). Green Bay’s last indoor preseason game came on Aug. 28, 2009, at Arizona. – Green Bay played the Colts at Lucas Oil Stadium in Indianapolis during the 2011 preseason, but the roof was open for that contest. Prior to the ’09 contest against the Cardinals, the last indoor preseason game for the Packers was at the Georgia Dome against the Falcons on Aug. 9, 2003. – Green Bay visited St. Louis last year in Week 7, the fifth time in seven years (2006-07, 2009, 2011-12) that the teams had squared off during the regular season. The Packers topped the Rams in the 2012 meeting, 30-20, with QB Aaron Rodgers connecting on 30 of 37 passes (81.1 percent) for 342 yards and three TDs. – Outside of their foes in the NFC North, the Packers have played more regular-season games against the Rams (five) under McCarthy than any other opponent in the NFL. – The Packers have won four straight against the Rams in the regular season and 10 of the last 13 meetings dating back to 1992. – Following the contest at St. Louis tonight, the Packers will host the Seattle Seahawks at Lambeau Field on Friday, Aug. 23, in a nationally televised game on CBS. This will be the 20th time in the last 21 seasons that the Packers have appeared on national TV at least once during the preseason. – These clubs first met in 1937, when the NFL launched its long relationship with the city of Cleveland. The franchises met every year from 1937-71 except 1943, when the Rams didn’t field a team. – Beginning in 1946, when the Rams moved from Cleveland to Los Angeles, these foes consistently played their Wisconsin games early in the year (before cold weather set in) and their warm West Coast games late in the year. – The clubs have met twice in the postseason, with the Packers topping the Rams, 28-7, in the 1967 Western Conference Championship in Milwaukee. The Rams beat the Packers, 45-17, in St. Louis in a 2001 Divisional playoff contest. – RB Edgar Bennett scored on a 1-yard run in the first quarter and WR Robert Brooks caught a 2-yard TD pass from QB Ty Detmer in the third quarter in the Green Bay win. – Green Bay’s defense limited the Rams to a pair of Tony Zendejas field goals and held Los Angeles to 79 yards rushing. – The Packers posted 150 yards on 39 carries (3.8 avg. ), with FB Dexter McNabb picking up 33 yards on four attempts (8.3 avg.). – Tuesday, Aug. 27 – Roster reduction to a maximum of 75 players by 3 p.m.
– Saturday, Aug. 31 – Roster reduction to a maximum of 53 players by 5 p.m.
– Sunday, Sept. 8 – Regular-season opener at San Francisco 49ers, 3:25 p.m.
Packers DT Ryan Pickett was a first-round draft pick of the Rams in 2001 and played his first five NFL seasons (2001-05) in St. Louis…Packers TE Matthew Mulligan played in all 16 games for the Rams in 2012…Packers outside linebackers coach Kevin Greene was a fifth-round selection of the Los Angeles Rams in 1985 and played the first eight seasons (1985-92) of his career there. He ranks second in franchise history with 72.5 sacks…Greene played for Rams head coach Jeff Fisher when Fisher was the club’s defensive coordinator from 1989-91…Packers QB Vince Young played for Fisher for five seasons (2006-10) with the Tennessee Titans…Rams C Scott Wells played for Green Bay for eight seasons (2004-11)…Rams S Matt Giordano played in five games for the Packers in 2009…Rams secondary coach Chuck Cecil played safety for the Packers from 1988-92 and was a teammate of Packers offensive line coach James Campen…Rams wide receivers coach Ray Sherman held the same position with the Packers from 2000-04…Packers head coach Mike McCarthy coached with Rams quarterbacks coach Frank Cignetti at the University of Pittsburgh in 1989 and in New Orleans from 2000-01…McCarthy also coached with Rams offensive coordinator Brian Schottenheimer with the Kansas City Chiefs in 1998…Rams strength coach Rock Gullickson served as the strength and conditioning coordinator for the Packers from 2006-08…Gullickson and Rams assistant strength coach Adam Bailey also coached in New Orleans with McCarthy, assistant head coach/inside LBs Winston Moss and quarterbacks coach Ben McAdoo…Rams TE Lance Kendricks played at the University of Wisconsin and attended Rufus King High School in Milwaukee…Rams offensive line coach Paul Boudreau was Packers assistant offensive line coach Joel Hilgenberg’s position coach for seven seasons (1987-93) when Hilgenberg played on the line for the New Orleans Saints…Packers tight ends coach Jerry Fontenot played for the Bears when Rams assistant head coach Dave McGinnis was on Chicago’s staff…Rams director of operations Bruce Warwick spent six seasons (2000-05) with the Packers…Packers LB A.J. Hawk was a senior at Ohio State when Rams LB James Laurinaitis was a freshman in 2005…Other college teammates include Giordano and Packers QB Aaron Rodgers (California), Packers T/G Don Barclay and Rams WRs Tavon Austin and Stedman Bailey (West Virginia), Packers DT B.J. Raji and LB Robert Francois and Rams LB Jo-Lonn Dunbar (Boston College), Packers DE Datone Jones and RB Johnathan Franklin and Rams TE Cory Harkey (UCLA), Packers CB Casey Hayward and S Sean Richardson and Rams RB Zac Stacy (Vanderbilt), and Packers TE Ryan Taylor and Rams DE Robert Quinn (North Carolina). As per team tradition, the Packers select game captains each week. – Tonight’s captains will be WR James Jones (offense), DT B.J. Raji (defense) and P Tim Masthay (special teams). Tonight’s officiating crew includes referee Mike Carey (94), umpire Chad Brown (31), head linesman Mark Baltz (26), line judge Tim Podraza (47), field judge Jabir Walker (156), side judge Doug Rosenbaum (67) and back judge Brad Allen (136). The following players have been declared as inactive for today’s Packers-Rams game at the Edward Jones Dome. Note: As a result of LB D.J. Smith being placed on injured reserve on Wednesday, the Packers’ active roster stands at 52 players. Only six players needed to be declared as inactive today. Starting lineup changes: On offense, #89 James Jones will start at wide receiver in place of #85 Greg Jennings. On defense, #79 Ryan Pickett will start at nose tackle in place of #90 B.J. Raji. #99 Jerel Worthy will start at left defensive end in place of #79 Ryan Pickett. #93 Erik Walden will start at left outside linebacker in place of #53 Nick Perry. #29 Casey Hayward will start at right cornerback in place of #37 Sam Shields. Starting lineup changes: On offense, #68 Joe Barksdale will start at left tackle in place of #72 Wayne Hunter. #66 Shelley Smith will start at left guard in place of #69 Quinn Ojinnaka.